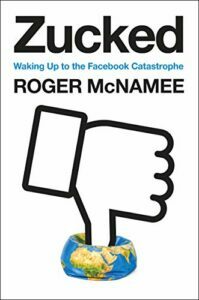 Zucked is Roger McNamee’s narrative of a good romance gone bad — except that the behaviors that led to the relationship breakup happen to be global, not personal. McNamee is a long-time, prominent member of Silicon Valley’s investor elite (Bono is one of his partners). He is also an early mentor to Mark Zuckerberg, and an early investor in Facebook. But after what he calls his ‘conversion experience,’ he is now one of the company’s fiercest critics. Therein lies a tale (and about half his book). McNamee begins his story by likening himself to the character played by Jimmy Stewart in Hitchcock’s Rear Window — minding his own business when he sees what looks like a crime in progress and grapples with what to do. “One day early in 2016 I started to see things happening on Facebook that did not look right. I started pulling on that thread and uncovered a catastrophe. In the beginning, I assumed that Facebook was a victim and I just wanted to warn my friends. What I learned in the months that followed shocked and disappointed me. I learned that my trust in Facebook had been misplaced. This book is the story of why I became convinced, in spite of myself, that [Facebook] was terrible for America and needed to change or be changed, and what I have tried to do about it. My hope is that the narrative of my own conversion experience will help others understand the threat. Facebook would first deny, then delay, then deflect, then disassemble. Only when the truth was unavoidable did Facebook admit to its role and apologize. Suddenly, a lot of people understood that apologies had been a standard part of Facebook’s public relations tool kit from Zuck’s days at Harvard. Zeynep Tufekci, a brilliant scholar from the University of North Carolina, framed Facebook’s history as a “fourteen-year apology tour.” I reflected that it might be time to tweak Facebook’s corporate motto: Move fast, break things, apologize, repeat. This review cannot cover nearly all the evidence that leads McNamee to his conclusion that Facebook is “terrible for America” (and even worse for much of the rest of the world). But his book makes clear that he is especially concerned about two systemic issues: 1) the ways in which Facebook is proving toxic for democracy, and 2) the ways in which social media andsmartphoness are proving toxic for children and adolescents. Given that, let’s look briefly at what he has to say on both these topics. “disregard expertise in favor of voices from their tribe. They refuse to accept uncomfortable facts, even ones that are incontrovertible . . . The tribe is all that matters, and anything that advances the tribe is legitimate . . . If you are a bad actor and you want to manipulate people . . . all you have to do is infiltrate the tribe, deploy the appropriate dog whistles, and you are good to go. That is what the Russians did in 2016 and what many are doing now. Which goes a long way toward explaining how “Pizzagate” — the conspiracy theory that high level Democrats, including Hillary Clinton, were running a child prostitution ring out of a DC-area pizzeria — was believed by more than half of Republicans at the time of the 2016 election. Democracy —dependent as it is on thoughtful deliberation and considered compromise, and at a bare minimum on our ability to tell truth from lies — hardly stands a chance.